Jim Dine (b. 1935), a modern American painter, sculptor, photographer, printmaker, and poet, is known for finding a subject that is important to him and repeating it many times over. He has said, "I always need to find some theme, some tangible subject matter besides the paint itself, otherwise I would have been an abstract artist. I need that hook ... Something to hang my landscape on. "(1) Closely identified with the Pop Art style, he maintains that whereas Pop Art was outward-looking and impersonal, his work is inward-looking and personal, even autobiographical. By virtue of the fact that Dine has painted, drawn, printed, and sculpted the heart so much for so many years, Dine has made the heart shape his own. He said “I choose an image and make it mine. I’m a different person when I come back to it twenty years later, but it’s still mine.” (5) Although the heart is a popular image in the common lexicon of visual language, Dine has succeeded in transforming it into his own personal symbol. Dine creates different textural areas in his paintings through his different forms of mark-making. Particularly in his larger paintings he intersperses and balances areas of textural detail with areas of thick impasto color. His draughtsmanship is precise but his drawing and painting are loose and experimental. Some edges are soft (or lost), some edges are hard (or found), with colors bleeding from the heart into the background. He has a very painterly and intuitive approach to applying the material to the surface. The surface is very active, both the positive space - the heart-shape - and the negative space - the background. There are active gestural marks unifying the positive and negative spaces. Dine sometimes paints one single heart, and sometimes paints several hearts together in a pattern. In his more recent paintings of hearts, done in acrylic rather than oil, (Rosecrucian Interior Scene, with Lemons, 2010) he was inspired by his artist's paint palette in his application of paint and has also mixed in different materials such as charcoal, sand, and wood. 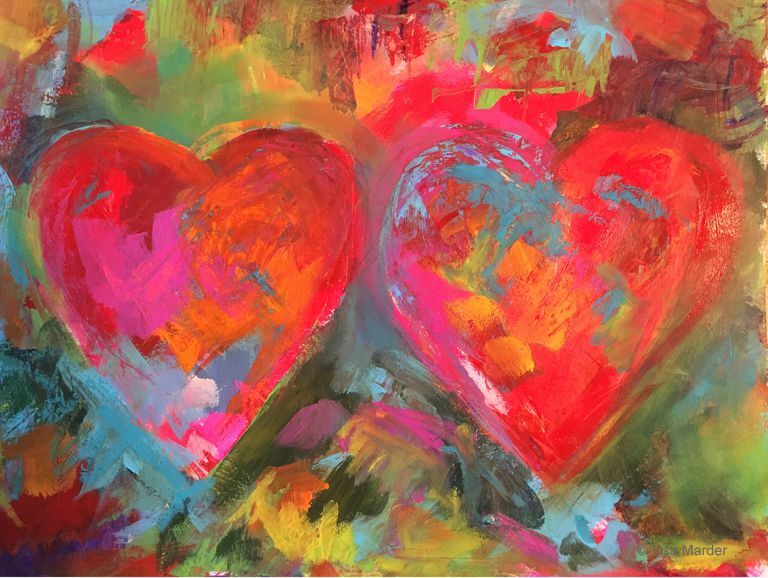 Painting a heart or multiple hearts in the style of Jim Dine is an excellent place to start experimenting with abstract painting techniques, particularly if you have a fear of abstract painting. The heart shape provides a simple structure that defines the composition while allowing the freedom to fill the painting surface in a multitude of different ways and to try new creative approaches, just as Jim Dine has done. This approach to abstract painting is appropriate for all ages. Start with a simple outline of a heart. Either draw a heart or several hearts free-hand or use a stencil. You can use a soft pencil, charcoal, or use your brush and fluid paint. You have many options for color. You can choose any color palette and in fact, might want to create your own series as you work through different color palettes. You can start by doing some monochromatic heart studies, just choosing one color, plus black and white. You can do hearts that use warm colors only, or cool colors only. You can create paintings that have a mostly complementary color scheme. Or you can choose five or six of your favorite colors and work with those, painting them randomly all over the canvas or paper. The color choices are endless, but regardless of which color palette you choose, the general process will be the same as you intuitively respond to each mark you make on the painting surface, with each mark and color informing the next. Create different textural effects in your painting using different tools. 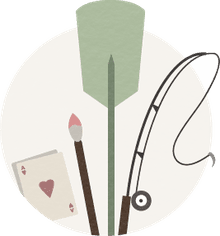 Besides using your painting knife there are many things you might already have around the house that you can use to create different textures - i.e. netting, combs, corks, credit cards, bubble wrap, saran wrap, to name just a few. Apply your paint both thickly with your palette knife and thinly. Use impasto and drips. Scrape back into your paint and wipe it off. Leave the pentimento (the trace of painting left beneath the layer you remove) for subtle and complex effects. Incorporate drawing. Try drawing on top of watercolor or acrylic. Remember you can paint or draw with oil over acrylic but not vice versa. Oil paint sticks (Buy from Amazon) are wonderful to draw with over both acrylic and oil paintings, as I did in my painting shown above. Used mixed media and collage. Combine different mediums in one painting. Tear up old paintings or painted pieces of paper, or pictures from magazines and apply them to the painting (acrylic paint works as an adhesive); or build them into the initial layer of gesso for textural effects. You might also add sand or sawdust to the gesso for texture. Remember to focus as much attention on the negative space as you do on the heart itself. Both spaces should be active with interesting marks and colors and surface treatment. Try painting hearts in different sizes. The size and scale of your heart will influence the gesture and marks you make. Have fun and experiment. Don't copy Jim Dine, but try to make these hearts your own by putting your own emotions into them and trying new techniques. What Are the Secrets to Painting Realism?